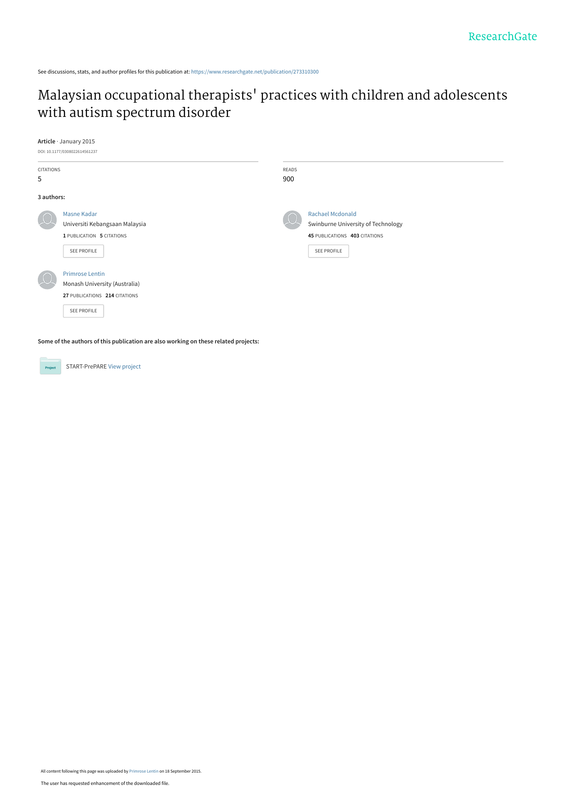 All content following this page was uploaded by Primrose Lentin on 18 September 2015.
adolescents with autism spectrum disorder in Malaysia, including the perceived training needs of practitioners. Method: We surveyed the registered members of the Malaysian Occupational Therapy Association using a mailed questionnaire. 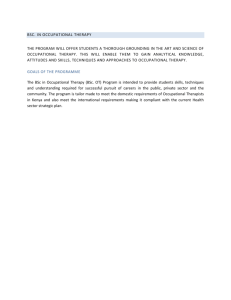 an in-depth exploration of the continuing education needs of occupational therapists in Malaysia. 1. Deﬁcits in social interaction and social communication. ratio of 4:1 (Fombonne, 2003). this, in addition to other approaches (Rodger et al., 2010). Medical Centre, 2009, personal communication). further education needs of Malaysian occupational therapists working with children and adolescents with ASD. therapy services for children with ASD in Malaysia. from that previously reported (Blumberg et al., 2013). programmes, social skills training, and educational intervention programmes (Case-Smith and Arbesman, 2008). McGinley, 2010; Shetreat-Klein et al., 2012). children and adults with ASD: Watling et al. (1999a) performed a study in the US; Ashburner et al. (2010, unpublished report) in Queensland, Australia; and Kadar et al. there are strong similarities in the ﬁndings of these studies. strategies in their interventions for children and adolescents with ASD (Arbesman and Lieberman, 2010). experts from the US, Australia, Malaysia, and Taiwan). The ﬁnal questionnaire was divided into six sections.
. Section A: the frame(s) of reference and model(s) of practice utilized with children with ASD.
. Section B: the assessments or outcome measures administered to children with ASD.
. Section C: the interventions utilized in occupational therapy services for children with ASD. occupational therapy services for children with ASD. 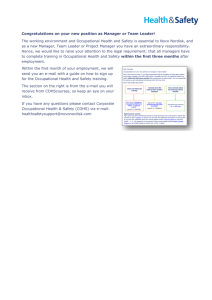 including personal and professional information. identifying potential respondents for the survey. weeks after the survey was sent (Salant and Dilman, 1994). certain areas, such as certiﬁcation in sensory integration. have worked with children and adolescents with ASD. reported seeing both age groups. muscle strength) (n ¼ 15). 3. behavioural skills training (n ¼ 4). 3. social skills training (n ¼ 8). who have worked as occupational therapists and with children and adolescents with ASD for less than 5 years. with children and adolescents with ASD is limited. Table 2. Preferred method of obtaining knowledge and skills. and 5 (preferred the most). in Malaysia with children and adolescents with ASD. assessments in their services for children with ASD. developed countries, this becomes even more essential. knowledge and skills through reviewing literature indicated by the respondents in this study is quite concerning. encouraging results were also achieved. future and directions of this profession in Malaysia. performance would be very worthwhile. other international studies (Ashburner et al., 2010, unpublished report; Kadar et al., 2012; Watling et al., 1999a). and adolescents with ASD highly utilized sensory integration therapy and sensory-based approaches in their theories, assessments, and interventions. interventions of daily living skills in their service for children with ASD. Occupational Therapy Association (MOTA) for its help in assisting with the addresses for mailing the survey to its members. et al., 2010, unpublished report) and for her generous help. agency in the public, commercial, or not-for-proﬁt sectors. Malaysia. Medical Journal of Malaysia 63(1): 1–3. Statistical Manual of Mental Disorders. 4th ed. – text revision. Washington, DC: American Psychaitric Association. for autism: Parental choices and perceptions of change. Case-Smith J (2005) Occupational Therapy for Children. 5th ed. 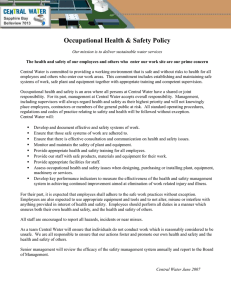 St Louis, Missouri: Elsevier Inc.
Diamantis A (2010) Defending occupation in pediatric practice. British Journal of Occupational Therapy 73(8): 343.
social skills and self-help skills in autism spectrum disorder. Research in Autism Spectrum Disorders 6: 431–441. Autism and Developmental Disorders 33: 365–382. movement skills of children with autistic spectrum disorders. Developmental Medicine & Child Neurology 51: 311–316. Autism: A Sensorimotor Approach to Management. 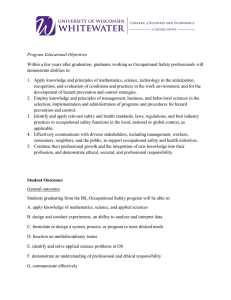 of Occupational Therapy 63(11): 516–522. Treatment of Children 32: 313–342. 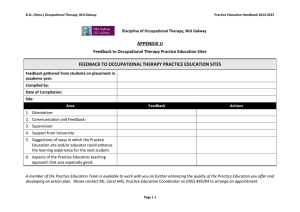 Occupational Therapy Journal 59: 284–293. 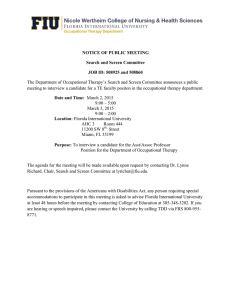 Journal of Occupational Therapy 34: 572–581. of Reference for Pediatric Occupational Therapy. 2nd ed. Philadelphia: Lippincott Williams & Wilkins, 119–159. Liamputtong P (2009) Qualitative Research Methods. 3rd ed. Victoria, Australia: Oxford University Press. elementary school children with autism spectrum disorder. Perceptual and Motor Skills 116(1): 197–209. between social welfare, health and medical systems for children with disabilities. Available at: http://www.jicwels.or. 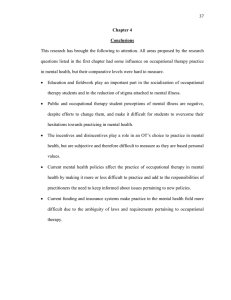 School, and Early Intervention 3(1): 61–75. 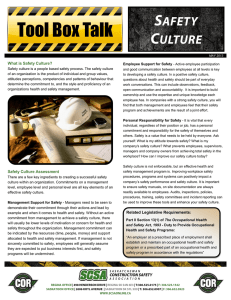 Occupational Therapy Journal 57: 276–280. Survey. New York: John Wiley & Sons Inc.
of Autism and Developmental Disorders 25: 51–60. disorders. Brain and Development 36(2): 91–96. 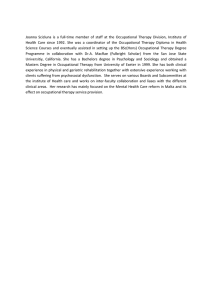 Occupational Therapy Journal 53(3): 237–238. 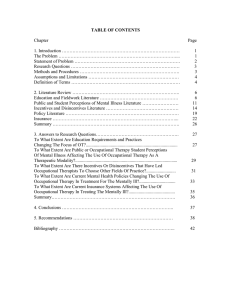 Journal of Occupational Therapy 53(5): 498–505. Washington. Unpublished tool, available from the author. Introductory to Survey Research, Polling and Data Analysis.